There are some moments in sports where the game freezes. A sense of disbelief holds in the air, for just a split second. There is a silence before the crowd erupts, before the players on the field totally comprehend what has happened, before the disc even has time to hit the ground. Anna Thompson’s block on double game point in the 2017 National final is one of those moments. Thompson didn’t react. She didn’t jump up to her feet with an emphatic fist pump or even crack a smile. She simply stood up and started to walk towards her spot as second in the stack, with the look of determination and focus in her eyes that seems to never leave her face while the pressure is on. It wasn’t just that block that catapulted Thompson to stardom in 2017. She made the Ohio Valley All-Region Second Team as a sophomore then earned a spot on Philadelphia AMP’s starting O-line. She went onto make the USA Under-24 Mixed National Team, earn All-Club First Team honors in her rookie year, be named First Runner-Up for the Mixed Player of the Year Award, and win a world title with the U24 Team. 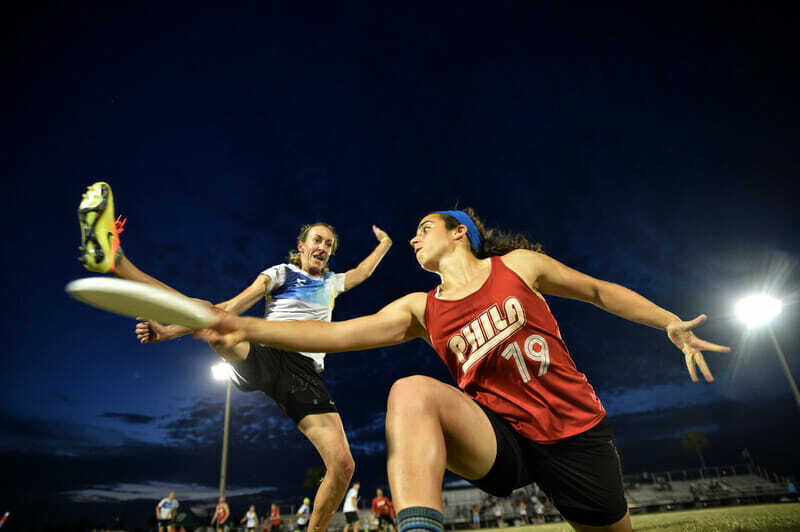 But how did Thompson go from being a relative unknown who hadn’t played ultimate in four years to being named the second most valuable player in the Mixed Division? Comments on "Without Fear: Anna Thompson’s Rise To Stardom"